Club Penguin Cheats by Mimo777 Club Penguin Cheats by Mimo777: Club Penguin Herbert's Revenge in UK and Australia Coming NOT SOON! 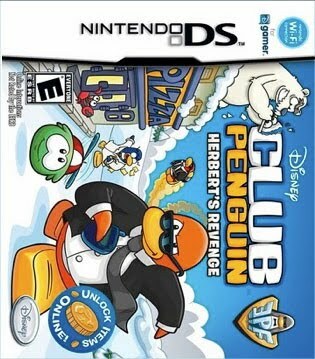 Club Penguin Herbert's Revenge in UK and Australia Coming NOT SOON! Yeah you heard that right! Club Penguin Herbert's Revenge is NOT coming soon to United Kingdom and Australia! WHA? Herbert's Revenge is coming REALLY soon! June 26 for the UK, and July 7 for Australia. Sorry about that! I had to see if you were paying attention! Awesome news for our great buddies over the pond. You will LOVE IT! I wonder why they don't release it all over the world at the same time?. Anyone know? Make sure you check out ALL the complete Missioner here. They dont release them at the same time becouse each country has different people how need to look through the game and change anything needed such as translations. Do you know when you are going to post the caption contest weiners? I got it today! I'm 19% through it though. I love the fact you can go to previous missions back from PSA! Wow you made me panic for a minute!! I'm in the UK, so i want it now!! its the best game ever on ds! For all of the UK people, saying it's not coming soon, it's coming TODAY!! Hope you can buy it! my friend her bday is today (26th) and she got it on SAME DAY! She has flare on cp! It takes long to get it from place to place? .-. Well ya but it is also the shipping,making the game,geting stocks in and getting ready for shipping. wat??? wat r u talking about??? Mimo, there was NO point in doing that to see if we were paying attention. It's probably offensive to people in the UK and Australia too. Not the smartest thing to do. I'm not telling you how to run your blog or anything, but if I were you, I wouldn't have posted that on my blog. Mimo, look at these comments. People actually think that it's gonna be late. Please don't post something like that next time. Umm... England and Australia both speak English. XD It may be because they need to find stores to sell it there, etc. I bet Mimo is working on it, but he is probably busy. He will most likely post them soon! That's my least favorite part, having to redo them. Have you found the snake game pieces yet? They are really hard to find! Lol! I read Billybob's post and when I got here, I'm like "What?!". Mimo tricked us all. Wasn't it supposed to come out already? That is pretty unfair, but I'm sure they are getting it ASAP. Oh! I thought it came out already! I hope you are enjoying it! There's been some controversy on that! O_o I said a big word. It might come out in different parts of the UK at different times! I had a bit of a shock at first, when you said not coming soon. I almost flew out of my chair. But then I read, It's coming really soon! Club Penguin studios is in America. They make the game there, I think. It will take at least 2 weeks for shipping. Plus when they make the first game, they will need to make heaps of others. I know why they dont release it all at once. They need to do the translation stuff first and see if anyone reported gliches. Also the feed back and sold numbers of the game in the released countries to see if it is going to be popular and if they need to adjust the buying ratio and estimate how much more or less their older estimate was and adjust it. Also not to mention they have to do some paper work for the games. Well with movies, they are sometimes released on different dates because the movie has to first be distributed around the world, so I guess it's similar to DS games. They would then be sent to shops, and have to get ready for release. Also, one country's distributor might not want to release it. And the game might not meet the country's standards. Maybe time differences, in some countries they are a day ahead of us. im not trying to burst your bubble, but club penguin studios is in canada. but i catch your drift- canada is right next door, so i mean its still the same general area of the u.s.
That's awesome! I have Flare too! Tell her I said happy birthday! That's so cool! I have the first one too! If you can't figure something out, be sure to use Mimo's guide! It probably takes.... 1-2 days? Club Penguin has a lot of money, so they can get it fast! Haha, it was just a joke! =) Herbert's Revenge is coming out soon in England and Australia, if it hasn't already! Yeah, super cool! Do you have the game? Probably when/a little after it comes out in Australia! I hope you get it! It was just for fun! Chillax dude! I see how it could be offensive, but I don't think too may ppl will take it seriously. Are you from the UK or Australia? Maybe it's late because it takes a long time to get over a big pond. I bet he'll post them soon. Then again, soon could mean in a couple of weeks! Guess we'll have to wait and see. Only time will tell. That might be right! But actually, the main headquarters of Club Penguin is in CANADA! I know, weird! Yeah, that's true! Also, when exactly did you turn into a fish? LOL! I agree! I've almost beat it. 73% away. Soon im sure. We'll play Club Penguin until hes done with it. Cool! Early! Early gamers rock! Lol, true that. It's pretty awesome! Lol, that is so funny, it came in the United States on my birthday and I got it the same day. I went to Walmart at about twelve AM the night it came out and I got it. Talk about early gaming. Yea, you'll like it. Its really fun and challenging. Have fun! Yea, Mimo was making sure you were paying attention. It was a Mimo test! Yea, I guess. I don't know all about that and why. I guess maybe it's partly shipping and having enough to sell and all that stuff. He's talking about when the game comes out in different countrys. Am I missing something? Not sure but Club Penguin is trying really hard to get the game over the world. Im sure they will get it to you soon. Soon im sure. Keep watching out for them. Good luck if yours is chosen! because it takes a long time for ships to carry all the games to all around the world and then they need to translate it and rate it again and etc. They dont release them at the same time for economical reasons. If they released it at the same time, they would get a sudden flow of money but after a few months, the excitement would die down and they would cease receiving money. So instead of a lot of of money in a short period they stretch it out for a long period. It also adds suspense for the later countries. Mimo, it came out in the UK June 25! Im from Australia and We speak the same langauge at the creators of Club Penguin.. So probs a different reason. sory for not modding lately my bros here and my last day of school was on friday but ill be modding starting now! ~~~~~~~~~~~~~~~~~~~~~~~~~~~~~~~~~~~hi you idk am i beind confusing like idk? Awsome! I'm in the UK and i got it friday! I've completed it already without your help mimo! It was kinda easy. For a minute there you almost scared me to DEATH, I don't have a ds but I wonder if they'll bring out prepaid membership card in AUST. Those are the dates it comes out. BillyBob posted it on his blog. I'd like to know that too! maybe soon? MIMO guess what, I GOT IT! I live in the uk, I got it for £23.93 !!!!!!! Ill start playing it 2moz! ITS AWESOMENESS! NOT AS AWESOME AS MIMO! Tm from the UK and I got it Saturday. they don't release it at the same time (which I agree is comepletly unfair) is because they have to translate the words and see if there are any errors so if so they can improve them and fix it. For example when the first pokemon diamond and pearl came out in japan you could surf on the wall in the elite four. they fixed that for the english version. Haha cool! Tell her happy bday for me. :) Im glad she got an awesome bday present! Your right, good thinking. Keep on commenting! Cool, make sure to give us feedback! Keep on commenting! Woah! I guess you were playing in the car, unless you were driving! Wen will it come out in New Zealand? I bought the game but I got no code! Thats strange - I have seen it in NZ! Usually things go to australia first, but obviously not for herbert's revenge! YAY! Cause of massive amount of shipping the game. And in order to do that, they need money. Also translations like bguy7 said (good point). Also, Bobhead said that australia and the U.K both speak english (refuting on bguy7). What about if they want the game to be on China? Mandarin or something is the main llanguage there. I live in Australia and went to a store called GAME. They realesed the game on June 12th for us! What is going on Mimo??? Hey Mimo, have you played poptropica? It is cool! Although I like CP better. I agree onn what Savvy is saying. Please, you hurt some ppl and getting them confused (I am so confused already). What does the blog about Cp cheats software thingy all about? I quit modding when I heard that you took some moderators away. WHY DID YOU DO THAT? The Volcano Is Smoking again at the dojo. Ouch star thats kinda mean.Heh but Mimo77 was just kiddin man getover it its just like having a bit of a joke! ??? ?I went to GAME last month and it was there! I live In SCOTLAND! i got it!! its really fun. i finished all the missions. pretty easy! Wat! ?ye they did release em. i sAW EM at my locale shop! in th uk . to bad i didnt get em. theres a deel to get it with card jitsu . I'm going to buy it tomorrow - my friend downloaded it and it's awesome!